Since 2013, Hublot has been paying tribute to the Ferrari LaFerrari hypercar. In partnership with the brand, the watchmaker has unveiled an updated version of the MP-05 model. Called the MP-05 LaFerrari Sapphire, the mechanical timepiece comes with a sapphire case (hence the name) and only 20 pieces will be made. Within the 53.5-gramme encasing, a total of 637 components and a suspended vertical tourbillon have been carefully fitted. 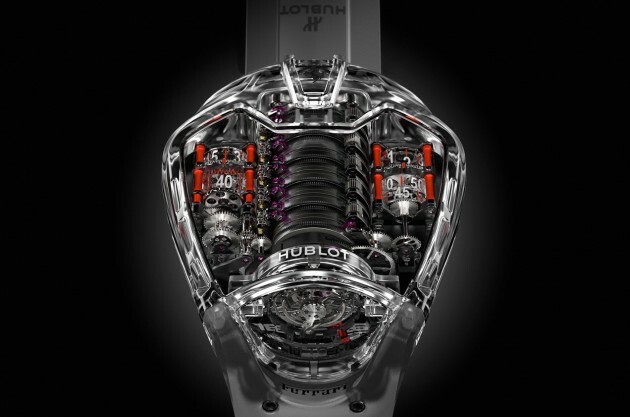 The seconds are shown on the transparent cylinder on the suspended tourbillon cage. As for the hours and minutes, they’re situated to the right of the barrels, while the power reserve is on the left – shown via transparent cylinders too. The mechanical art comes attached with a transparent silicon strap with a clasp that also features pieces carved out from sapphire. To get the clock ticking, the watch is wound by a mechanism that requires a miniature power drill. This concept is inspired by the tyre-changing tool in Formula 1. No prices quoted here, but seeing that the first LaFerrari MP-05 was priced at USD$300,000 (RM1.2 million) this should cost more. As for the hybrid hypercar, at the heart of it, sits a naturally-aspirated 6.3 litre V12 engine that churns 800 hp at 9,000 rpm and 700 Nm at 6,750 rpm. It’s matched to a Hybrid Kinetic Energy Recovery System (HY-KERS) with a 163 hp electric motor. Combined, the LaFerrari churns out 950 hp and 900 Nm of torque. The engine is paired with a seven-speed dual-clutch transmission. Previous Post: Adakah enjin GDI/TGDI yang sedang dibangunkan oleh Proton ini boleh menggunakan Euro 2M RON 95?